"The Sun Always Shines On TV" is a live single taken from the live album How Can I Sleep With Your Voice In My Head - a-ha live. The single was released on 10th March in Norway, Germany, Denmark, Austria and Czech Republic, on 7th March in Switzerland and 17th March in Sweden. The cover shows a live shot of the band on stage at Ullevaal Stadium in Oslo (08/06/02) taken from the back left hand side of the stage (Magne's side). 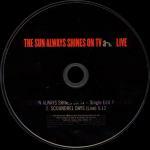 At the top of the sleeve, " The Sun Always Shines On TV" is printed in red capital letters, " a-ha" is printed in white lower case letters and "Live" is again printed in red capital letters. The spine and fold over part is white with text in black. The inside sleeve features a close-up shot of a bundle of cables with track information in white letters. The disc is black with the title in red and silver just above the centre. Additional text and track information is printed in silver towards the bottom of the disc. The regular European 4-track release features an edit version of the title track plus the live album version with slightly longer intro and outro with Morten's chat edited out. It also includes the live version of Scoundrel Days (taken from the bonus disc of the live album) plus the video version (mpg format) which includes live and backstage footage from the Lifelines tour filmed by Lauren Savoy. The German 4-track CDs come with an red and white RTL Grand Prix sticker on the front of the jewelcase. The following text is printed at the top of the sticker "Der Hit Zur Grand Prix Saison 2003". Underneath, the Grand Prix dates for Melbourne, Sepang, Sao Paulo and Imola are listed. In addition, those 4-track CD single used for promotional purposes may have a black and white "PR-Copy" sticker on the reverse. These promo copies come with a black and white text promo insert which is 2-sided (although side 2 only has the text "Fans der Welt einnehmen" which is the end of the last sentence on side 1!). A two track single was released in Norway, Sweden (and France? ), it comes in a slimline jewelcase and has similar sleeve and disc to the 4-track release. It includes only the Single Edit of The Sun Always Shines On TV and the live version of Scoundrel Days. The two track single was also used for promotional purposes in Sweden Germany and comes with a large rectangular sticker on the front with the title, additional information, including release information (radio release 6/3, shops 17/3). There is a one track promo single featuring the Single Edit live version (3:59). This also comes in a slimline jewelcase and has similar sleeve and disc to the regular release. The main difference is the addition of the text "For promotion only. Not for sale." printed in small white capital letters underneath the title on the top right hand side of the front sleeve. Some of these promo CDs have a black and white "PR-Copy" sticker stuck on the reverse of the jewel case.